Simple, wallet sized fresnel magnifier that provides 3x magnification with a 5x spot lens. Card size is 2" x 3-3/8". 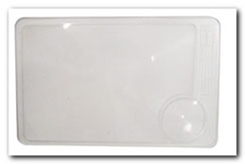 Includes plastic storage sleeve. Great for restaurant menus!